Offering you a complete choice of products which include Reducer Type Terminal Ends such as Aluminum Reducer Type Terminal Ends and Copper Reducer Terminal Ends. Our organization is engaged in manufacturing and supplying a comprehensive range of Copper Reducer Type Terminal Ends to our esteemed clients. These products are extensively utilized in numerous industrial applications. These products have been appreciated by the clients for their high performance and corrosion resistance. We offer an extensive range of Aluminium Reducer Type Terminal Ends of flawless quality, which we pack as per the client’s specific demands. This product is a connecting device that accommodates two electrical conductors to form a straight line. 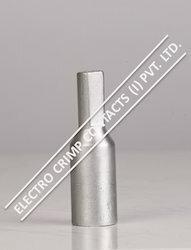 Furthermore, these terminal are electro plated to make these corrosion and abrasion resistant. Looking for Reducer Type Terminal Ends ?